As you may know, RabbitVCS is a graphical front-end for version control systems available on Linux. It integrates into file managers to provide file context menu access to version control repositories. 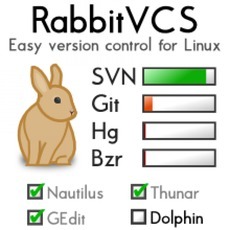 The project was originally called NautilusSvn, but due to the desire to support file managers in addition to Nautilus and more version control systems, it was renamed to RabbitVCS (Version Control System). The interface was inspired by TortoiseSVN, recognisable by the file manager shell integration, which is available on Nautilus and Thunar in the case of RabbitVCS. It can also integrate into Gedit or run independently on the command line. The RabbitVCS PPA supports Ubuntu 13.04, Ubuntu 12.04, Ubuntu 12.10, Ubuntu 11.10, Ubuntu 10.04 and their derivatives, such as Linux Mint and Elementary OS. Before the PPA adds support for Ubuntu 13.10. Download & install the Deb from this page.